A Raikot based girl has alleged that a group of six persons, including three girls, raped her in a hotel on Ludhiana-Ferozepore road and even video-filmed her. R S Model School in Model Town. A former scientist with Punjab Agricultural University has sued an ex-VC seeking damages of Rs one crore for alleged malicious prosecution. The Division No 5 police booked two girls on the complaint of a Hargobind Nagar resident. The mortal remains of eminent English and Punjabi writer Surinder Singh Narula were consigned to the flames at the Model Town Extension cremation ground here today. Constituents of the Sant Samaj led by Baba Harnam Singh Khalsa and Baba Sarabjot Singh Bedi have urged leaders and activists of various radical Sikh religious organisations, who have gone abroad for varied purposes to return home. A heavy downpour after weeks of scorching heat though bringing respite for residents invited problems for the civic authorities who remained busy handling disposal of the rainwater today. Former Sarpanch of Sahnewal Khurd village and philanthropist Santokh Singh Sandhu is no more. A nagar kirtan being held in Mullanpur Dakha in connection with Guru Arjan Dev’s martyrdom day. A condolence meeting in the memory of Balbir Singh Bedi (75) was held by the local Bar Association under the chairmanship of Uttam Chand. The BSNL Employees Union Ludhiana sat on a day-long dharna on a call given by the Central Public Sector Undertaking trade unions to press upon their pending demands. The dharna entered its fifth day today. When a number of residents are crying water scarcity, there are some who do not mind wasting the precious commodity even as the Municipal Corporation authorities have been appealing to people to save every drop. Banty and his father, Jasvir Singh of Lohagam, Puna (Maharashtra), have allegedly committed fraud. Eastman Cast and Forge Limited today announced to start manufacturing power tools in Ludhiana, which is the first manufacturing plant of its kind in Punjab. Owners of several commercial establishments have come together to demand that the Municipal Corporation do a rethink of the laying of the service lane lane from Bharat Nagar Chowk to Arti Chowk. A deputation of the office bearers of PCCTU, led by state president prof S.S. Hundal, met BJP chief prof Rajinder Bhandari recently. Monica Arora, a student of Government College for Women feels that dedication, hard work and sincere efforts always pay in life. A 15-day practical computer assembling workshop concluded at government secondary school Naraingarh near hear today. 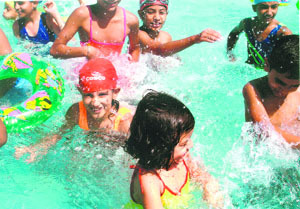 A 15-day-long summer camp ended in C.S. International School here today. 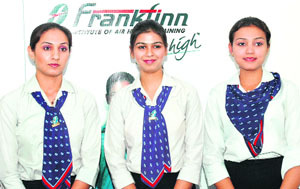 Three students of Frankfinn Institute here, Sukhdeep Kaur, Manasi and Ketaki Kalia, are all set to fly high with the international airline, Royal Jordanian, based in Amman. The district courts complex would now have round-the-clock electric supply. Punjab has finally woken up to promote religious tourism and has chalked out an elaborate plan to link various shrines not associated with the Ten Sikh Masters but other religions in the state. Apprehending possible reaction by activists of Sikh organisations against the government's failure to arrest chief of Dera Sacha Sauda Gurmit Ram Rahim Singh for his alleged blaspheming of the Sikh religious traditions before the deadline falling tomorrow, the police has intensified its vigil in the area.